NEW YORK -- A karaoke-loving ironworker who briefly became a New York sensation for his serenades from a subway construction site has been found dead in an apparent suicide, two months after he disappeared from his Queens neighborhood, police said Friday. Four years after Gary Russo's brush with fame, the "Second Avenue Sinatra" vanished without a trace after leaving his home shortly after midnight on July 28. Russo's family and friends, in a desperate search to find the divorced father of two, plastered fliers with his picture all over his neighborhood. On Friday around 2 p.m., a passer-by discovered Russo's body hanging from a tree in a park strewn with reeds in the outer-city neighborhood of Howard Beach, near where Russo lived. Police suspect the 54-year-old died in a suicide. The city's medical examiner will determine his cause of death. Earlier this month, Russo's car was found abandoned in the same neighborhood. 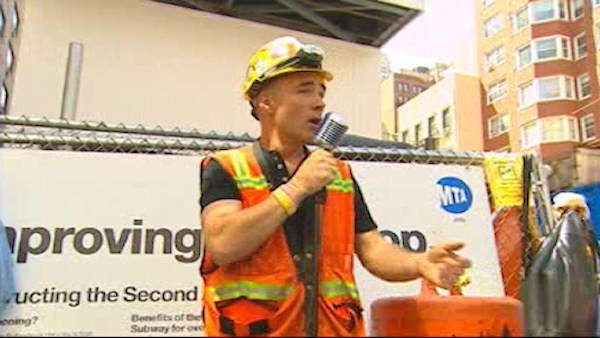 Russo was helping build the future Second Avenue subway under Manhattan's Upper East Side in late July 2011 when he began using his lunch breaks to start singing in public, serenading onlookers. Within a few weeks, Russo was featured on ABC's "Good Morning America" and MSNBC host Rachel Maddow declared him "The Best New Thing in the World Today." But his stardom was short-lived. Russo was transferred to another job site about a month later. Friends said Russo still performed at some small venues and gave motivational speeches. But he didn't seem like himself recently, friend Apryl Nebozenko told The Associated Press earlier this month, remarking that Russo seemed drained at a party she had in July. Nebozenko said Russo had been renovating a houseboat and working on a play about his life. Attempts to reach Russo's family late Friday night were unsuccessful.